Not to be confused with man-at-arms. A Master-at-Arms (US: MA; UK & some Commonwealth: MAA) may be a naval rating, responsible for law enforcement, regulating duties, security, Anti-Terrorism/Force Protection (AT/FP); an army officer responsible for physical training; or a member of the crew of a merchant ship (usually a passenger vessel) responsible for security and law enforcement. In some navies, a "ship's corporal" is a position—not the rank—of a petty officer who assists the master-at-arms in his various duties. The MAA is addressed as "Master" if holding the rank of chief petty officer, regardless of gender, and is often nicknamed the "jaunty", a corruption of the French gendarme, or the "joss/jossman". 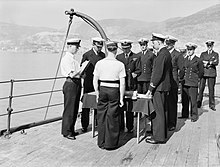 As a result of the Armed Forces Act 2006, the term Regulating Branch was changed to Service Police and the branch title changed to the Royal Navy Police and reported to their respective service's Provost Marshal, who was responsible to the First Sea Lord. In the British Army, a master-at-arms is a commissioned officer of the Royal Army Physical Training Corps, posted as an SO2 or SO3 at Divisional HQ or higher command, and responsible for overseeing all fitness training in subordinate units. The role is filled by RAPTC WO1s at Brigade HQs, while WO2s or staff sergeant PTIs are embedded at unit level. In the United States Navy, the Master-at-Arms rating is responsible for law enforcement, Investigations, K-9, expeditionary, and Anti-Terrorism/Force Protection (AT/FP) operations. It is one of the oldest ratings in the United States Navy, having been recognized since the Navy's inception. ^ "Regulating Branch and Royal Navy Police Association History". Regulating Branch and Royal Navy Police Association. Retrieved 13 June 2014.